Previous post: Playing with marmalade, indigo, satellites, and robots! 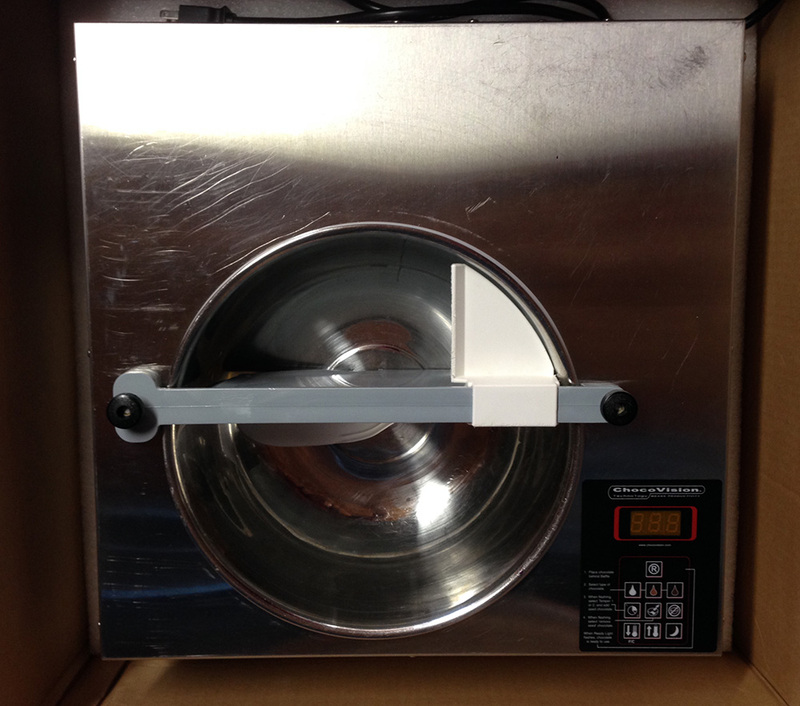 Yesterday morning, while perusing Craigslist, I spotted a wonderful bargain: a Chocovision X3210 chocolate tempering machine on sale, used, for less than half the list price! I jumped on it immediately, and brought home my prize yesterday evening. It’s just been refurbished by the manufacturer, so it should be good for many years to come. You can see the difference at a glance: the new one is sleeker, more durable, and far easier to clean than the other one. It also has some fancy settings, like automatic tempering routines. It warms the chocolate using heating coils, rather than the two 100-watt light bulbs used by the older machine. Since 100-watt light bulbs are increasingly antiquated and hard to find, this is an important upgrade! I had laid in a stock of 100 watt light bulbs for use with the machine, but still, I feel better knowing I no longer need to depend on them. The Chocovision X3210 is pretty clearly aimed at the small-scale professional and the ACMC is pretty clearly aimed at the hobbyist, so this is quite an upgrade. I’m very pleased with my purchase. 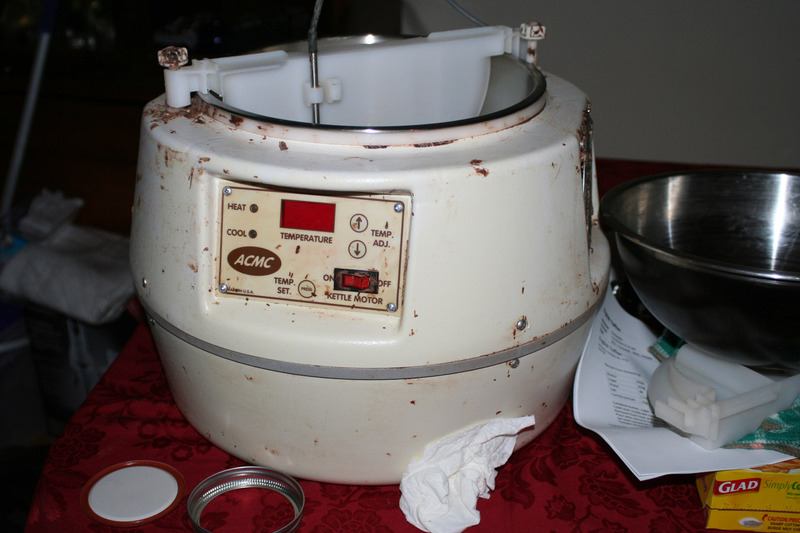 I will likely be selling the old ACMC tempering machine, so if you know someone who might be interested, let me know. I can send a supply of light bulbs if they are not available in the purchaser’s area. I will run a test batch of chocolates sometime fairly soon to test out the new machine. I haven’t yet decided whether to do a simple batch of jasmine tea/vanilla/honey caramels (my signature flavor, and my favorite of all my chocolate recipes) or whether to take the opportunity to test out a few new flavors. Since I won’t have time to do chocolates until early to mid May, I have time to think about it. Meanwhile, on the book, I have finished the rough-rough draft of my Creative Cycle sample chapter and will be reviewing it with my critique partner tonight. It’s gone surprisingly well! I was worried that I might not have enough examples for the chapter, but since I wisely kept nearly all the muslins for Autumn Splendor, and have a collection of shawls that were worked in series, I have enough to carry the chapter. The next step on the book will be editing both sample chapters and rewriting the table of contents. After that I will need to rewrite the book proposal, but that should be relatively simple. On the color study, I’ve discovered that I’m short some weft colors. I need to dye some reds, turquoise, and bright greens. I’m at CNCH most of the weekend but will try to squeeze in some dyeing as well. It might be challenging, though, as I have fifteen pounds of Sorrento lemons (the lemons used in limoncello – very hard to find) winging my way from a grower in San Diego. Candied Sorrento lemon peel, Sorrento lemon marmalade, and maybe a batch of limoncello are in my future! 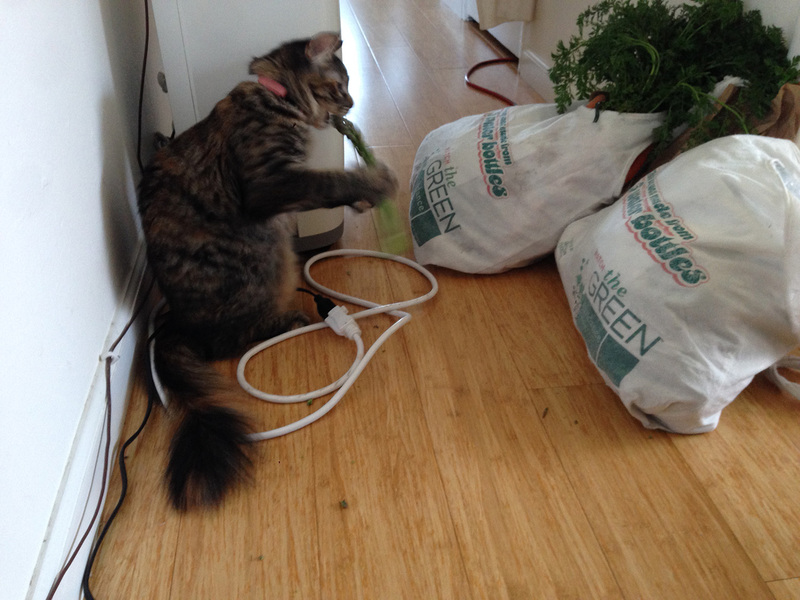 This was one of the only veg. my old dog would eat. Enough like grass I think.